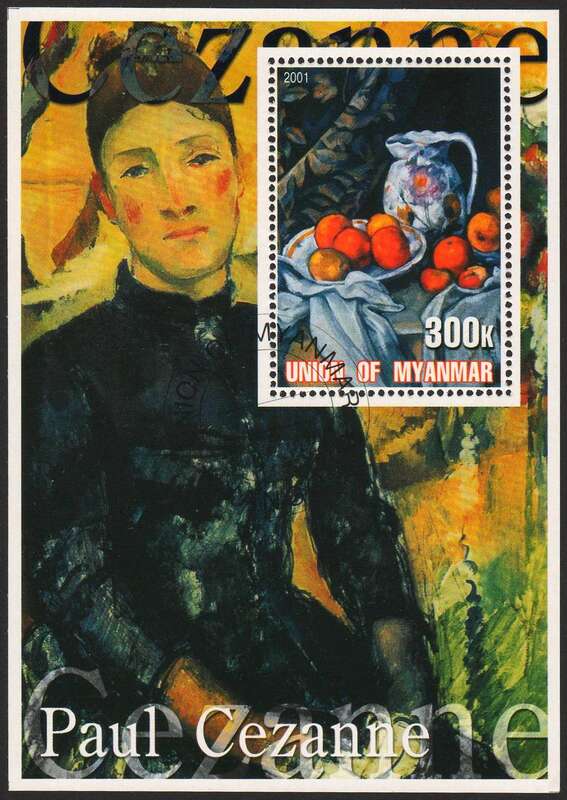 This Paul Cezanne CTO S/S is part of a set of 6 on impressionist painters dated 2001. 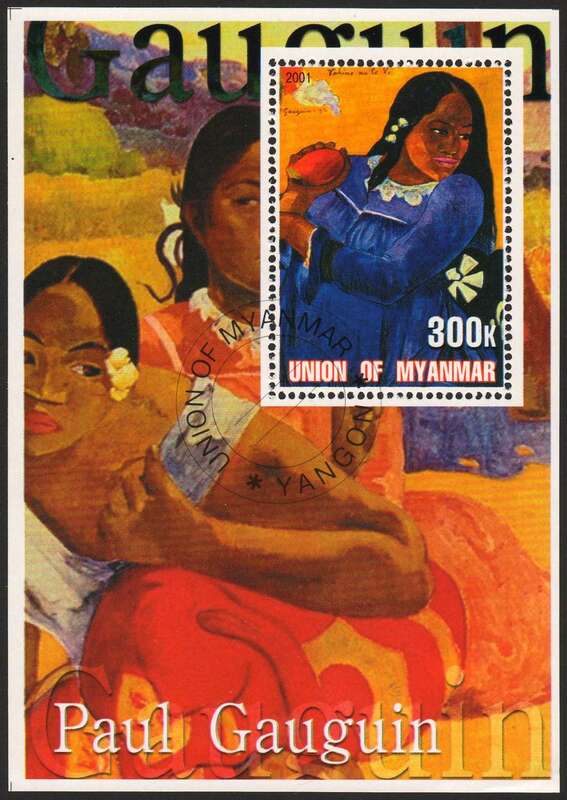 This Paul Gauguin CTO S/S is part of a set of 6 on impressionist painters dated 2001. 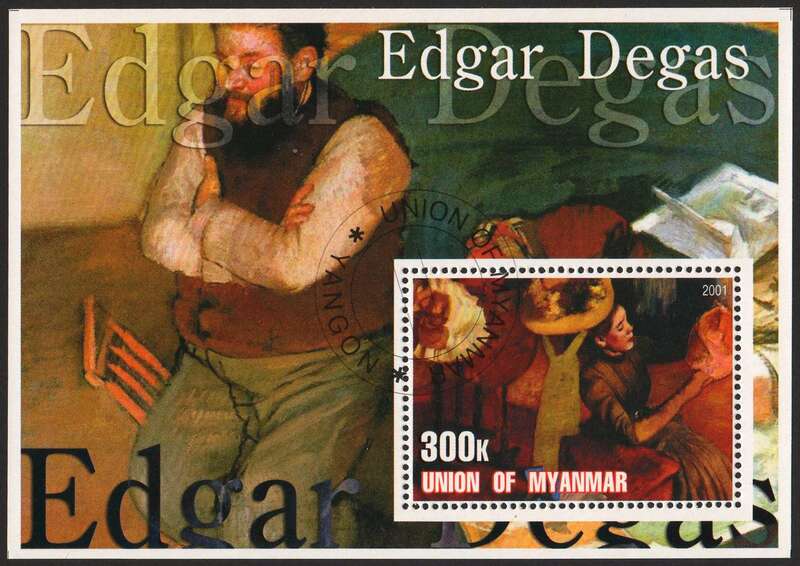 This Edgar Degas CTO S/S is part of a set of 6 on impressionist painters dated 2001. 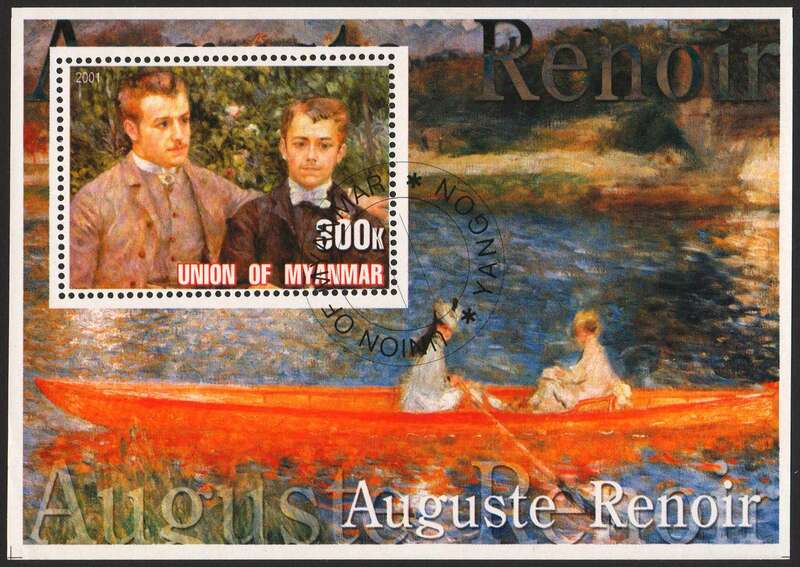 This Pierre-Auguste Renoir CTO S/S is part of a set of 6 on impressionist painters dated 2001. 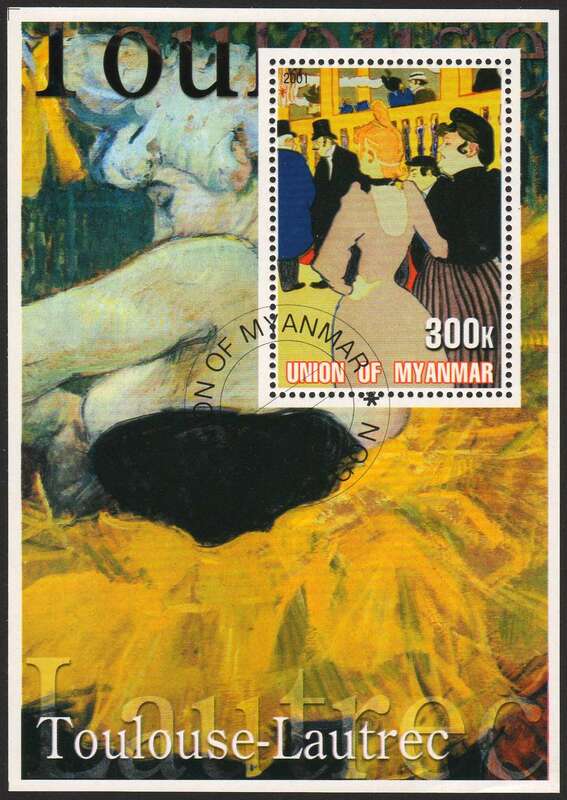 This Henri de Toulouse-Lautrec CTO S/S is part of a set of 6 on impressionist painters dated 2001. Pycnodysostosis is nicknamed Toulouse-Lautrec Syndrome after this painter. Amazing how many syndromes many famous painters had. I'm guess that a lot of future syndromes will be named after stamp collectors! Make sure you know how to spell pycnodysostosis. You never know when it might turn up in a Spelling B competition. 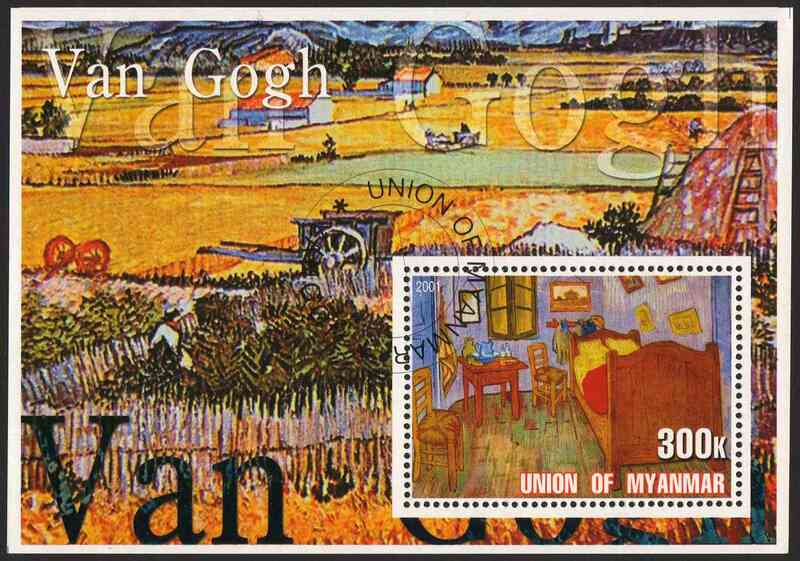 This Vincent van Gogh CTO S/S is part of a set of 6 on impressionist painters dated 2001. Have never seen these. It's amazing what I've picked up (bogus stamp-wise) when I've bought boxes of stuff at auction in the past. I made up a stockbook of dinosaur stamps from wherever for my 6-year-old grandson last Christmas and he loved them ... for about a half-hour, then he picked up his iPad and lost himself for two hours. Oh yeah, some dealers love to use these to "fill up" box lots. They are probably cheaper than packing peanuts, although I hate to pay for the shipping. The ones I'm posting in the recent "bogus" threads all came from one box lot of mixed material. It forms a stack a several inches high, of which there should be 100+ different. Hidden in all this "junk" were about 100 sets of Scott listed S/S's that turned out to catalog for $3K+. I had missed them on my first quick-look through the lot, and was initially very disappointed. Somehow I did end up with a bargain -- but I really had to hunt for them! So don't give up, because you never know what might be in that "other" envelope!